Municipal official, MLA (1950-1953), MLA (1954-1957), MLA (1958-1959), MLA (1959-1962), MLA (1963-1966), MLA (1966-1969). Born at Winnipeg on 14 April 1900, son of William Homer Shewman (1868-1938) and Jennie Faux (1875-1955), he moved with his parents to Morris in 1915. He was for many years in partnership with his father in a road construction business. He later worked as an auctioneer and insurance agent. He served on the school board from 1925 to 1938. 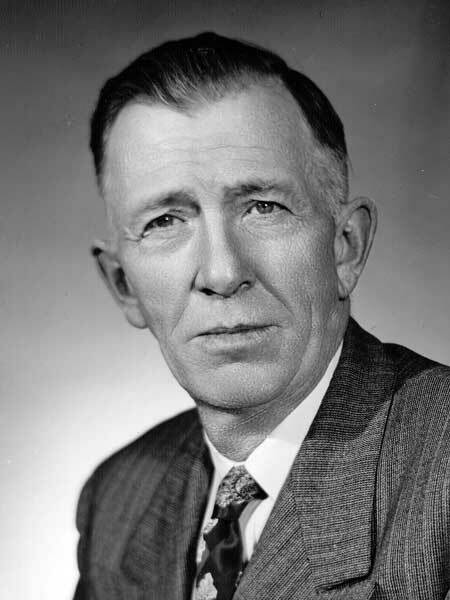 Shewman was Mayor of Morris from 1948 to 1954, and was elected to the Manitoba Legislature in 1949, re-elected as an Independent in 1953 and as a Progressive Conservative in 1958, 1959, 1962, and 1966. He was Chairman of the Legislature’s Livestock Marketing Committee and Farm Machinery Enquiry Committee. He was active as a flood fighter in the 1950 flood and supervised the evacuation of the town of Morris. In the legislature he was an advocate of flood protection and crop insurance for farmers. He also served as President of the Morris Agricultural Society and a Director of the Manitoba Telephone System. On 29 February 1920, he married Violet May Mitchell (1899-1970) of Morris. They had three daughters. He was a member of the Morris Legion and Morris Golf and Country Club. He died at Morris on 13 July 1968 and was buried in the Morris Cemetery. Obituary [William Shewman], Winnipeg Tribune, 6 June 1938, page 7. “MLA’s funeral Tuesday,” Winnipeg Free Press, 15 July 1968, page 4. Obituary, Winnipeg Free Press, 15 July 1968, page 24.